Published by Florist Review. October Edition. Every year, International Floral Distributors, Inc. (IFD) partners with a leading flower trend forecaster to research consumer buying behavior and the social, political and environmental factors that affect their decisions. IFD then releases this information in its annual “Flower Trends Forecast” to provide the floral industry with the information necessary to meet and respond to customers’ evolving preferences. 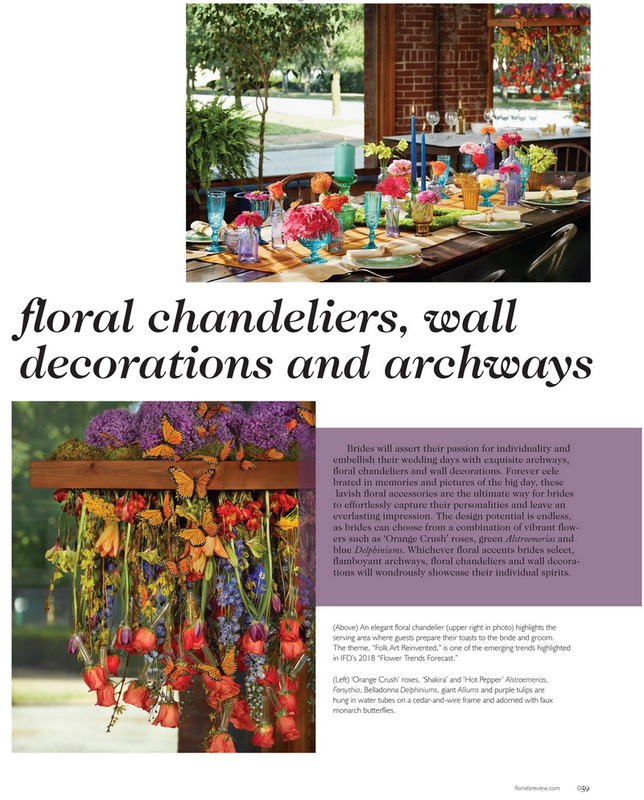 As part of the 2018 “Flower Trends Forecast” (available Oct. 1), IFD collaborated with Michael J. Skaff, AIFD, AAF, PFCI, to provide flower experts with the upcoming year’s flower, color, décor and wedding trends. Michael utilized his experience with the Color Marketing Group (colormarketing.org) and the International Interior Design Association (iida.org) to equip IFD and the flower industry with today’s consumer floral wants. Here is a look at what IFD discovered about 2018’s brides and what their buying preferences will likely be regarding bouquet and accent décor designs, flowers and styles. As part of the 2018 Flower Trends Forecast, IFD collaborated with Michael J. Skaff, AIFD, PFCI, AAF, to provide flower experts with the upcoming year’s flower, color, decor, and wedding trends. Skaff utilized his experience with the Color Marketing Group, National Interior Design Association, and the White House to equip IFD and the flower industry with today’s consumer floral demands. IFD would now like to share what they discovered about 2018’s brides and their buying preferences regarding bouquet and accent decor designs, flowers, and styles. With society’s constant bustling, brides are aiming to ground their wedding in nature’s serene ambiance. Though the vintage country trend is dwindling, the garden design continues to flourish and captivate brides across the world with its beautiful use of more foliages and plants. The outdoor look is reinvented with cleaner lines as living greenery bouquets flaunt organic succulents and flowing seeded eucalyptus. Often featuring delicate white flowers, this earthy style conveys a more refined, natural feel with its use of textured foliages like jasmine, acacia, dusty miller, and foxtail grass. 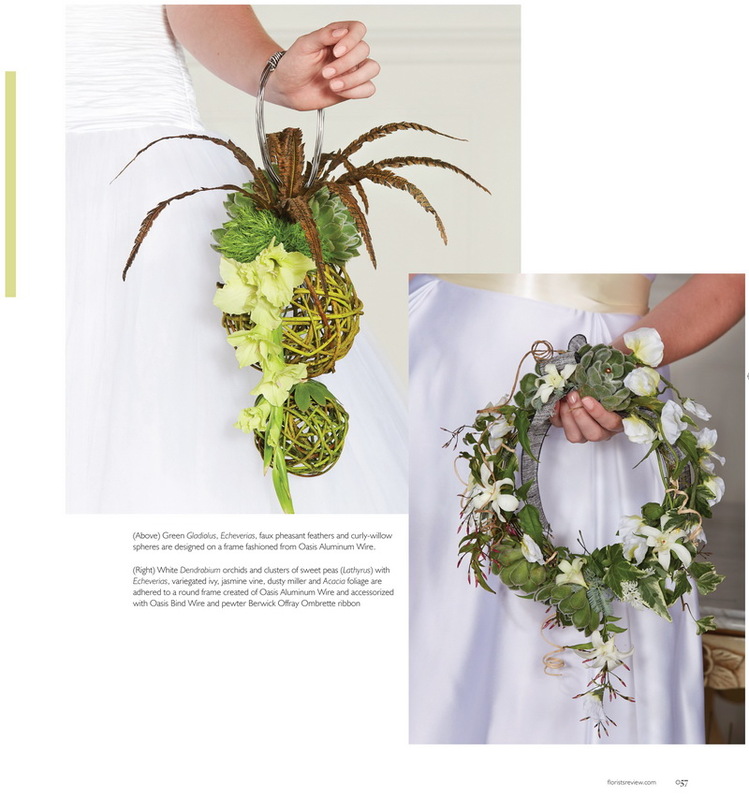 Brides will showcase their love of nature and its calming beauty through a living greenery bouquet that is both stylish and eco-friendly. 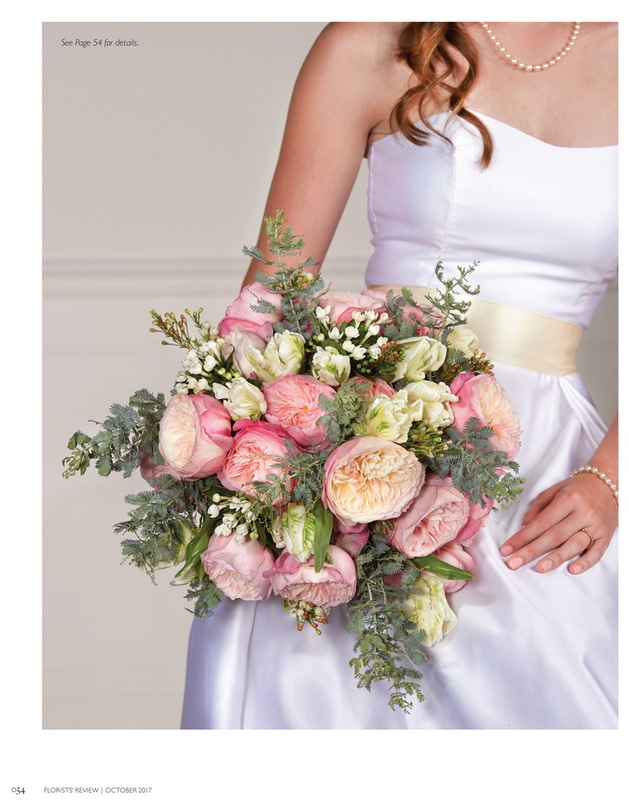 David Austin Purity roses, peonies, dahlias, rice flower, foxtail, variegated ivy, acacia foliage, and dusty miller are arranged in a FloraCraft Gala Bouquet Holder. White anthuriums, dendrobium orchids, and mini calla lilies are paired with gladiola florets, hanging amaranthus, Echeveria succulents, galax leaves, and jasmine vine in an Oasis European Square Bouquet Holder. Green gladiola, Echeveria succulents, faux pheasant feathers, and curly willow balls are designed on an Oasis Aluminum Wire frame. White dendrobium orchids and sweet peas cluster with Echeveria succulents, variegated ivy, jasmine vine, dusty miller, and acacia foliage on an Oasis Aluminum Wire frame and are accessorized with Oasis Bind Wire and pewter Berwick Offray Ombrette ribbon. In today’s dynamic world, individuals of all backgrounds, cultures, and walks of life aim to embrace their individuality and revamp traditional conventions. 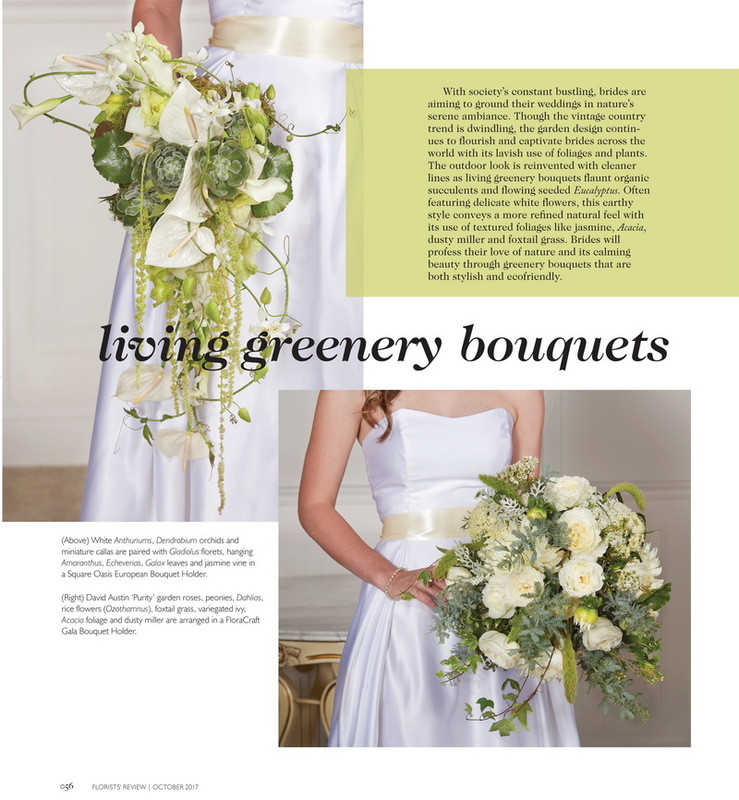 The modern bride will echo this trend with her desire for an updated twist on a classic bouquet. 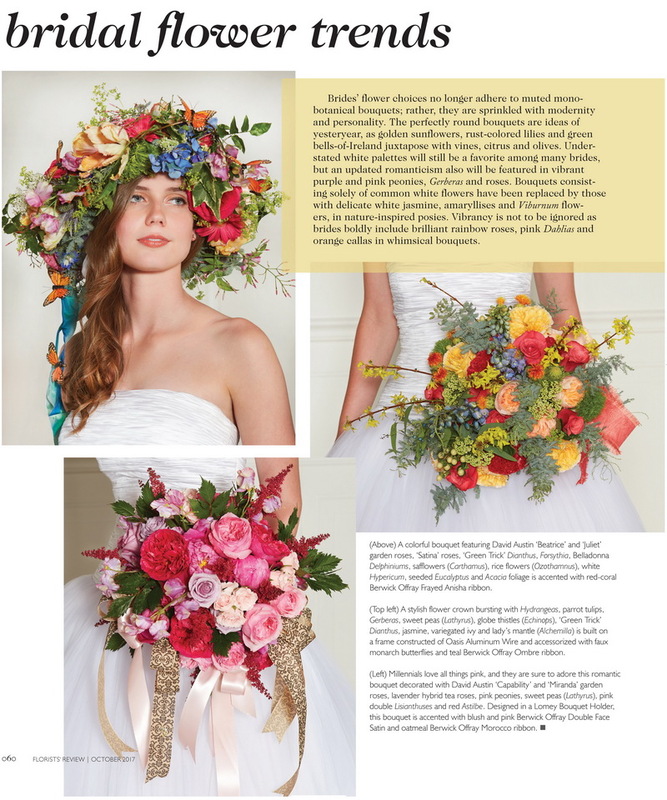 Rather than accompany her unique gown with the compact, cookie-cutter bouquet of years’ past, the contemporary bride will choose eclectic flowers that combine traditional and contemporary design in an updated color palette. 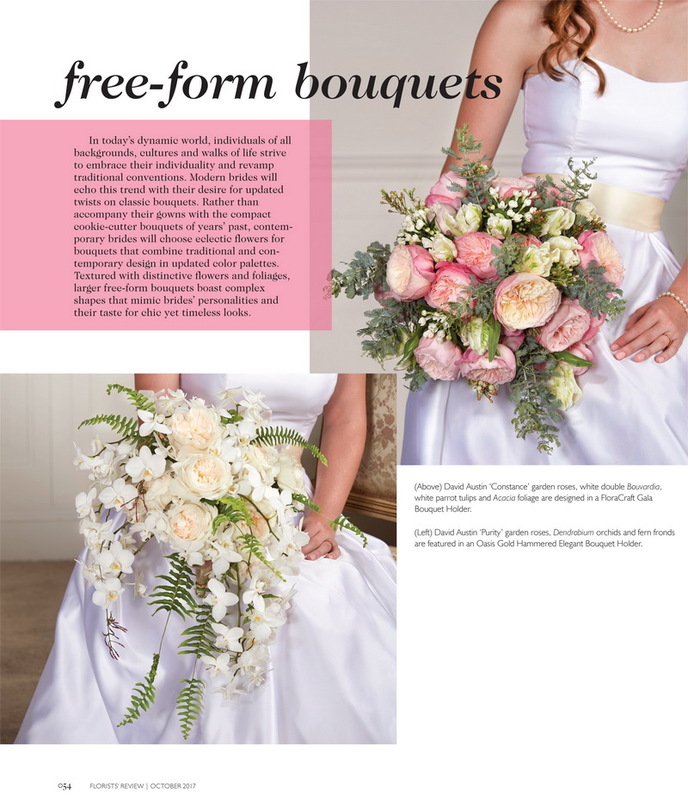 Textured with unique flowers and foliages, larger freeform bouquets boast a complex shape that mimics the bride’s personality and her distinct taste for a chic, yet timeless look. David Austin Purity roses, dendrobium orchids, and fern fronds are featured in a gold metallic hammered Oasis Elegant Bouquet Holder. David Austin Constance roses, white double bouvardia, white parrot tulips, and acacia foliage are designed in a FloraCraft Gala Bouquet Holder. Brides will assert their passion for individuality and embellish their day with exquisite archways, floral chandeliers, and wall decorations. Forever celebrated in memories and pictures of the big day, these lavish floral accessories are the ultimate way for the bride to effortlessly capture her extraordinary personality and leave an everlasting impression. The design potential is endless as brides can choose from a combination of vibrant flowers such as Orange Crush roses, green alstroemerias, and blue delphinium. Whichever floral accent the bride selects, these flamboyant archways, floral chandeliers, and wall decorations will wondrously showcase her quirky spirit. Orange Crush roses, Shakira and Hot Pepper alstroemerias, forsythia, belladonna delphiniums, giant allium, and purple tulips are hung in water tubes on a cedar and wire frame and adorned with faux monarch butterflies. This elegant floral chandelier highlights the serving area where beloved guests prepare their toasts to the bride and groom. The theme, Folk Art Reinvented, is one of the emerging trends highlighted in IFD’s Flower Trends Forecast 2018. Brides’ flower choices no longer adhere to the muted, monobotanical sprays of our ancestor’s traditions, but are sprinkled with modernity and personality. The perfectly round bouquets are ideas of yesteryear as golden sunflowers, rust-colored lilies, and green Bells of Ireland juxtapose with vines, citrus, and olives. Understated white color palettes will still be a favorite amongst many brides, but an updated romanticism will also be featured in vibrant purple and pink peony, gerbera daisy, and rose blooms. Bouquets consisting solely of white daisies have been replaced by delicate white jasmine, amaryllis, and viburnum flowers in the nature-inspired bridal posy. Vibrancy is not to be ignored as brides boldly include brilliant rainbow roses, pink dahlias, and orange calla lilies in their whimsical bouquets. A colorful bouquet featuring David Austin Beatrice and Juliet roses, Satina roses, Green Trick carnations, forsythia, belladonna delphiniums, safflowers, rice flowers, white hypericum, seeded eucalyptus, and acacia foliage is accented with red coral Berwick Offray Frayed Anisha ribbon. A stylish flower crown bursting with hydrangeas, parrot tulips, gerbera daisies, sweet peas, echinops, Green Trick carnations, jasmine, variegated ivy, and alchemila is built on an Oasis Aluminum Wire frame and accessorized with faux monarch butterflies and teal Berwick Offray Ombre ribbon. Millennials love all things pink, and they are sure to adore this romantic bouquet decorated with David Austin Capability and Miranda roses, lavender roses, pink peonies, sweet peas, pink double lisianthus, and red astilbe. Designed in a Lomey Bouquet Holder, this bouquet is accented with blush and pink Berwick Offray Double Face Satin and oatmeal Berwick Offray Morocco ribbon. International Floral Distributors, Inc. is a marketing consortium of 19 flower distributors with over 60 locations in the United States providing flowers, supplies, and an annual Flower Trends Forecast to leading floral decorators, designers, and retailers. 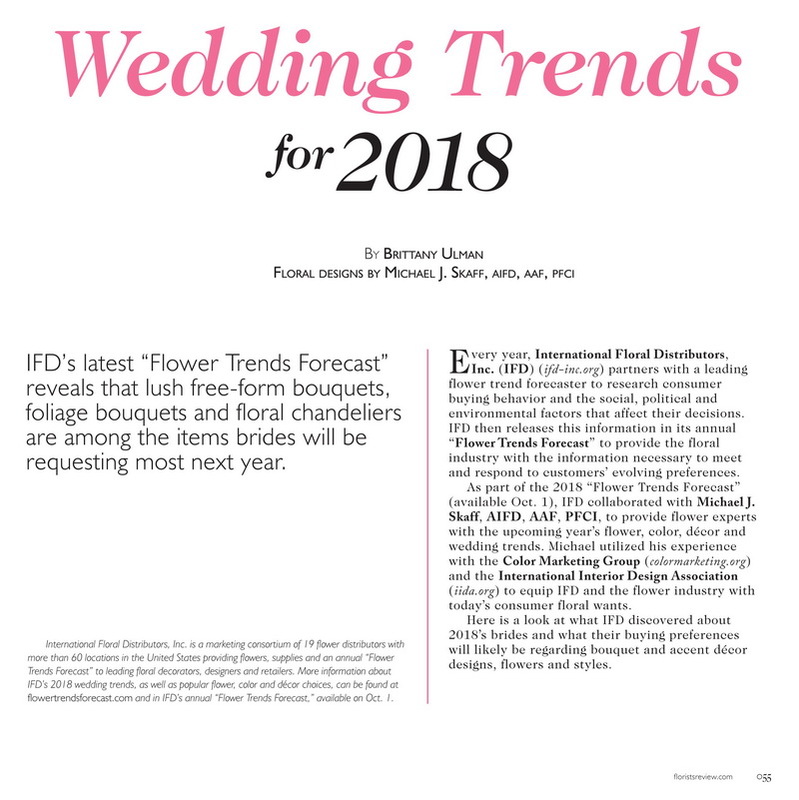 More information about IFD’s 2018 wedding trends, as well as popular flower, color, and decor choices, can be found at flowertrendsforecast.com and in IFD’s annual Flower Trends Forecast, available on September 28.